One hundred and ten years ago, on June 30, 1900, one of the worst maritime disasters in New York history took place when a fire broke out at Pier 3 in Hoboken. The blaze, which may have started spontaneously in a bale of cotton, engulfed ships from the North German Lloyd Line, one of the most prestigious passenger ship companies of its day. By the end of the day somewhere between 325 and 400 people had been killed, many of them trapped inside the burning ships. The fire broke out about 3:55 p.m. and despite the fact that the fire department was notified almost immediately, it was soon burning out of control. Four Lloyd Line ships were docked in Hoboken at the time, the Saale, Bremen, Main, and the line's flagship, the Kaiser Wilhelm der Grosse, then the largest passenger ship in the world. The Saale was scheduled to depart the next morning; the others were busy loading in coal for departures later in the week. The Kaiser Wilhelm also had a number of tourists aboard who had come to see the magnificent ship up close. Within a few minutes, the fire had leaped from the pier to the Saale and within twenty minutes all four ships were on fire. The blaze was so huge that it could be seen from every office tower in Manhattan as well as from points south on the Jersey Shore. 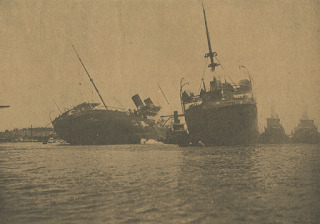 Dozens of ships in the harbor raced to aid of the burning vessels. The Kaiser Wilhelm, which carried the most passengers, was pulled into the Hudson. Though her bow and stern had caught fire, these blazes were soon brought under control and the ship was able to anchor safely in the river near 46th Street. All passengers and crew on the Kaiser Wilhelm were saved. The same could not be said about the other ships. The Saale and Bremen (the two ships closest to the initial fire) had burned through their mooring lines and were adrift. The Saale floated down toward Governors Island and the Bremen floated toward Pier 18 (at today's South Street Seaport), where it set the pier on fire. In both ship, dozens of people were trapped and while they were able to open the portholes (or the glass had burst in the fire), they could not get out -- portholes in this era were only 11 inches wide. The Saale was eventually towed to Communipaw, New Jersey, where she sank ten minutes after arrival. The Bremen and Main were tugged to Weehawken. The Kaiser Wilhelm had seen so little damage that she was put back in service almost immediately. * The Bremen and Main needed major repairs, but they, too, soon rejoined the Lloyd Line. But the Saale, the oldest of the four ships, was scrapped. In all over 27 ships were damaged that day in the fire, many of them tugboats that had come to the aid of the burning cruisers. Just four years later, the General Slocum would catch fire in the East River leading to the death of 1,021 New Yorkers. These two events were instrumental in improving safety regulations on passenger ships in American waters. * The Kaiser Wilhelm was converted into a military transport during World War I and sank off the coast of Africa. 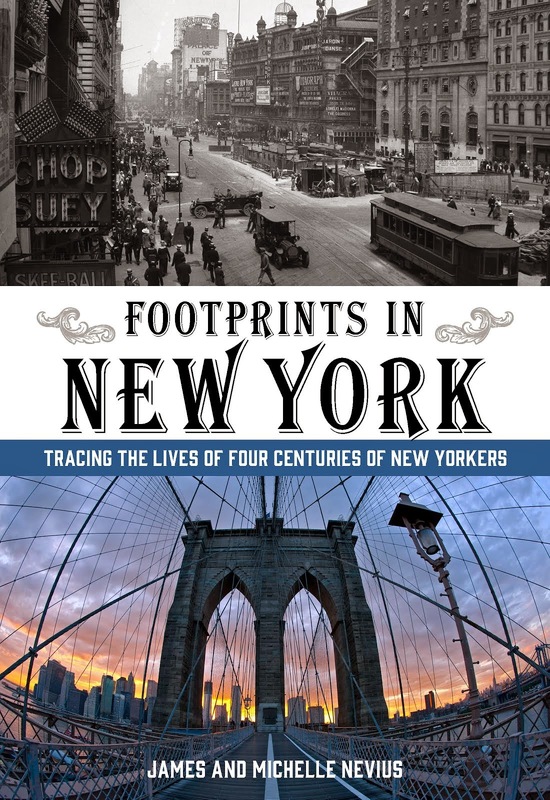 On Sunday, June 27, at 4:00 p.m., we will join with Shakespeare & Co. Booksellers in Greenwich Village to offer a free, one-hour walking tour of the heart of this historic neighborhood. We’ll meet at Shakespeare & Company’s store at 716 Broadway and walk west toward Washington Square, highlighting some of the stories featured Inside the Apple. Sunday the 27th is also Pride Day and while we won’t get as far west as Sheridan Square and the Stonewall Inn, we will talk a little bit about the Village’s crucial role in the gay rights movement. The tour will last about an hour and end back at Shakespeare & Co. for a Q&A. Books will, of course, be available for sale and signing. Please meet at the Shakespeare & Co. store at 716 Broadway (at Washington Place). In order to start on time, please plan to be there by 3:50PM at the latest. On June 16, 1890 -- one hundred and twenty years ago today -- the second, and arguably most famous, of the arenas to bear the name Madison Square Garden opened for business. 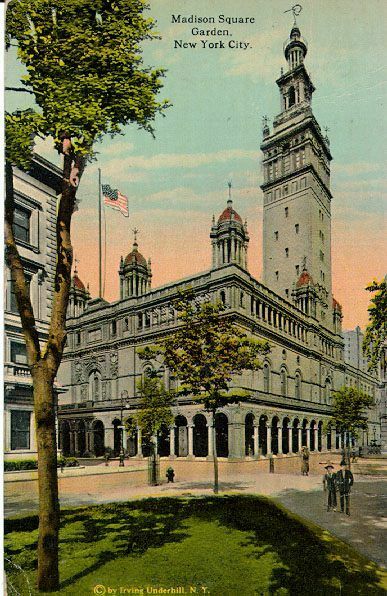 Designed by famed architect Stanford White, it was New York's biggest entertainment venue and is still considered by many to be one of the greatest buildings of the Gilded Age. 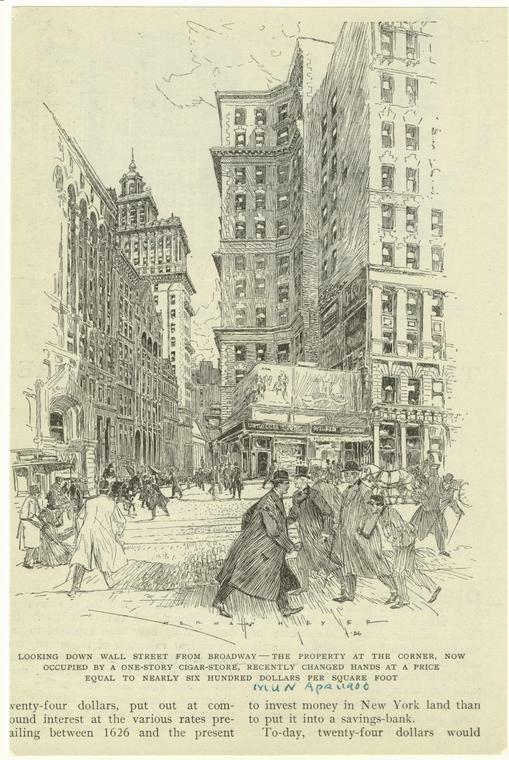 The first venue to be called Madison Square Garden opened on Madison Avenue and 26th Street in 1874. Originally named the "Monster Classical and Geological Hippodrome," it was run by P.T. Barnum in a converted railroad freight building. In 1879, William K. Vanderbilt renamed the building Madison Square Garden, using it as a velodrome as well as a site for boxing matches and other sporting events. However, the building was open air and was torn down in 1888 so that an enclosed arena could go up on the spot. Stanford White's Garden, which opened two years later, essentially contained four theaters: the main amphitheater, with seating for 8,000 (and plenty of additional standing room), a concert hall, a 1,200-seat theater for plays, and a rooftop garden and cabaret. It was this last theater that became most famous when it was the site of the "crime of the century": White's murder in June 1906 during a performance of Mam'zelle Champagne. The Garden's 32-story Moorish tower was originally topped with an 18-foot statue of Diana by Augustus Saint-Gaudens. Made of bronze and weighing 1800 pounds, the statue was designed to be weather vane that spun in the wind. White and Saint Gaudens soon had second thoughts about this and the statue was removed to be sent to the 1893 Columbian Exposition in Chicago (where it was eventually destroyed in the fire that engulfed the fair grounds). 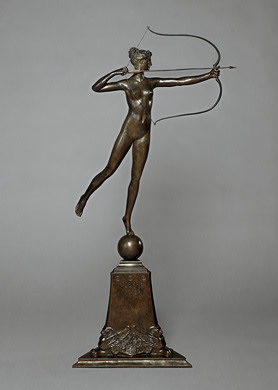 A lighter, fixed, 12-foot version of Diana was then set atop the Garden, where it stood until the building was demolished in 1925. That Diana now resides at the Philadelphia Museum of Art, though a copy is also at the Metropolitan Museum. 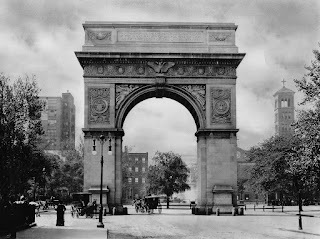 When White's Garden had been built, Madison Square was still in the center of the city's entertainment district, with theaters stretching from 14th Street up Broadway to 38th Street. 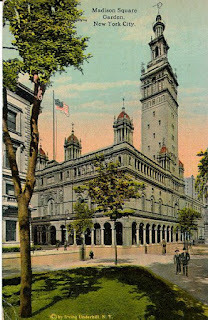 However, with the creation of a new Broadway theater district centered around Times Square in the early 20th century, Madison Square Garden suddenly began to seem too far downtown and in 1925, the Garden moved to Eighth Avenue and 50th Street. That building was, of course, subsequently replaced by the current Garden that was built after the destruction of Charles McKim's Penn Station in 1964 (the other crime of the century). Interested in more Stanford White architecture? Grab a copy of Inside the Apple and download our walking tour of White's architecture. Today marks the 105th anniversary of a record-setting real estate sale in Manhattan -- the purchase of 1 Wall Street for $700,000, or $4 a square inch, on June 7, 1905. As skyscrapers began to proliferate in the financial district, the owner of 1 Wall Street refused to sell his old cigar store for "personal" reasons. 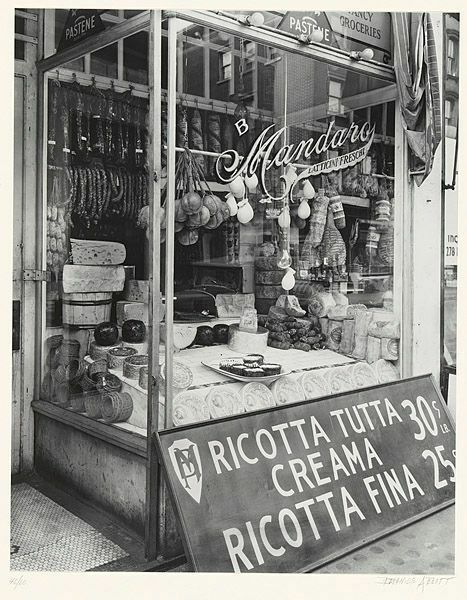 (You can see the cigar store in the drawing, right, in the foreground.) Only upon the owner's death did the land finally change hands. The new owners, the St. Louis-based Mercantile Trust Company, erected a thin 18-story skyscraper on the lot, soon dubbed the "Chimney Corner" due to its narrow shape. The Chimney Corner, opened in 1908, only lasted about twenty years. In 1928, the Irving Trust Company purchased the lot and the adjoining building at 7 Wall Street to raze them for a gigantic office tower. Though it is not known exactly how much Irving Trust paid for each individual lot, Daniel Abramson notes in Skyscraper Rivals that it would have been "in the range of $15 million....making it possibly the most expensive piece of real estate in the world." When Irving Trust was preparing the build their new skyscraper, The New Yorker did some due diligence on 1 Wall Street and discovered that the bank was only the fifth owner of the lot since the 1600s. What makes it especially important to us is that the first owner, back in the 1650s, was Johannes Nevius, James's great-great-great-great-great-great-great-great-great grandfather. We surmise that Johannes's house was knocked down when the wall that gave its name to the street was built in 1653. Who built on the site next is unclear, but William Dyckman was living at 1 Wall Street in the 1820s. Presumably it was Dyckman's house that was replaced by the cigar store, then the Chimney Corner, and then Irving Trust. When the bank's cornerstone was laid in 1930, two men were invited to participate in the festivities: a descendant of Washington Irving, for whom the bank was named, and a descendant of Johannes Nevius. Irving Trust still looms over the corner of Wall Street and Broadway today, though it is now known as the Bank of New York. Its original public lobby--now closed to the public--has fantastic mosaics by Hildreth Maier that we'll discuss in a later blog posting. Last weekend, the new Luna Park opened at Coney Island to much fanfare. Today, of course, the amusement park section of Coney Island is tiny compared to what it was in its heyday at the turn of the 20th century, when rides and amusements filled the boardwalk from end to end. Modern visitors who want to relive a little bit of the area's history can ride the Cyclone, the 1927 wooden roller coaster on Surf Avenue. 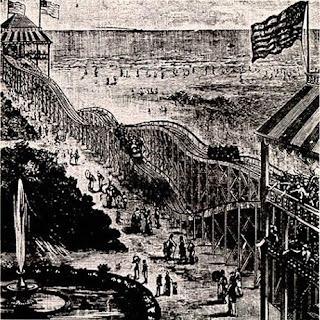 However, the history of the roller coaster is much older than the Cyclone and this Sunday marks the birthday of Coney Island's (and America's) first roller coaster, the Gravity Pleasure Switchback Railway, which opened on June 6, 1884. Modeled on an earlier coal railroad at Mauch Chunk, Pennsylvania, that had been successfully turned into an entertainment, the switchback was the brainchild of LaMarcus A. Thompson. Visitors would climb to the top of a tower and board a car that then dropped six hundred feet over an undulating track. At the far end the car would be "switched back" to another track and returned to the tower. Thompson envisioned his ride as wholesome family entertainment -- in a period when amusement parks were often seen as dens of sin and iniquity -- and the cars, traveling at an "invigorating" six miles per hour, provided great views of the Coney Island beach and boardwalk. * He charged 5 cents a ride and made back the $1600 he'd invested in the roller coaster in less than three weeks. It is unclear how long the Switchback Railway lasted at Coney Island (or even precisely where it stood). Despite its early success, Thompson soon faced a host of competitors and his original coaster may only have stood for three years. However, Thompson's career in designing roller coasters was just beginning. Firmly believing that his passengers wanted to see beautiful things as they rode his rides, Thompson went on to create numerous scenic switchback coasters where the cars entered tunnels painted with dioramas of nature scenes. Eventually the painted scenes gave way to dark tunnels, adding to the thrill. As Thompson built more rides, he improved their technology adding such features as cable pulleys to haul the cars to the top, linked cars to create longer trains, and emergency brakes in case of accident. Though Thompson didn't hold the patent on the original roller coaster,** by the end of his life he had patented more than 30 improvement to the ride and is still known to this day as the "Father of Gravity." * The ferris wheel -- normally the best place to get a view at an amusement park -- was not invented until the 1893 Chicago World's Fair. ** The patents for the first roller coasters were issued in 1872 and 1878; however neither of the original patentees ever built a working model, making Thompson's ride the first of its kind.